How Does a Platform Lift Work? Platform stair lifts can add mobility to a home or business for anyone who uses a wheelchair. Many disabled Americans struggle with accessibility issues. When someone is restricted to a wheelchair or motorized scooter, they have trouble independently traveling between floors. Since walking up and down the stairs is no longer an option, people with physical disabilities need a mobility product that can safely and efficiently help them. Anyone who uses a wheelchair or motorized scooter will benefit from using an inclined platform stair lift. 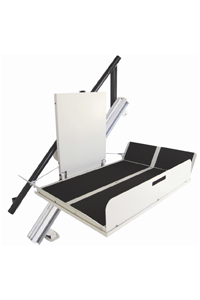 Inclined platform stair lifts are used to carry someone in a wheelchair up a set of stairs. They work by using a small electric motor to move the platform up and down an inclined track. The track is installed on the side of the stairs against the wall. The platform is then connected to the track. The platform can fold up when the lift is not in use so it does not block the stairway. An inclined platform stair lift is a very safe mode of transportation between floors for someone in a wheelchair. They come with several safety features such as ramp obstruction sensors, an over speed governor, and a non-skid surface. There are also gates that automatically flap up and down on the front and back of the platform and a sidewall. Inclined platform lifts allow a person in a wheelchair or motorized scooter to independently travel up or down a set of stairs without getting up. Inclined platform stair lifts can be used at home or business, both inside and outside. By having an inclined platform stair lift installed in his or her home, a person restricted to a wheelchair or scooter can once again travel between floors independently. Mobility can be increased in any building, indoors or outdoors, when a platform stair lift is installed.